Posted August 6, 2018 by Sage & filed under Teaching, Training and Racing, Yoga. I’m excited to visit Boston again! My last trip there was for the 2008 Boston Marathon, which was so perfect that I never returned, despite having signed up subsequent races. I figured nothing could top the perfect weather and requalifying run, or the sweet time with my mother, who went to college in the city, or our fun watching the women’s Olympic qualifier. 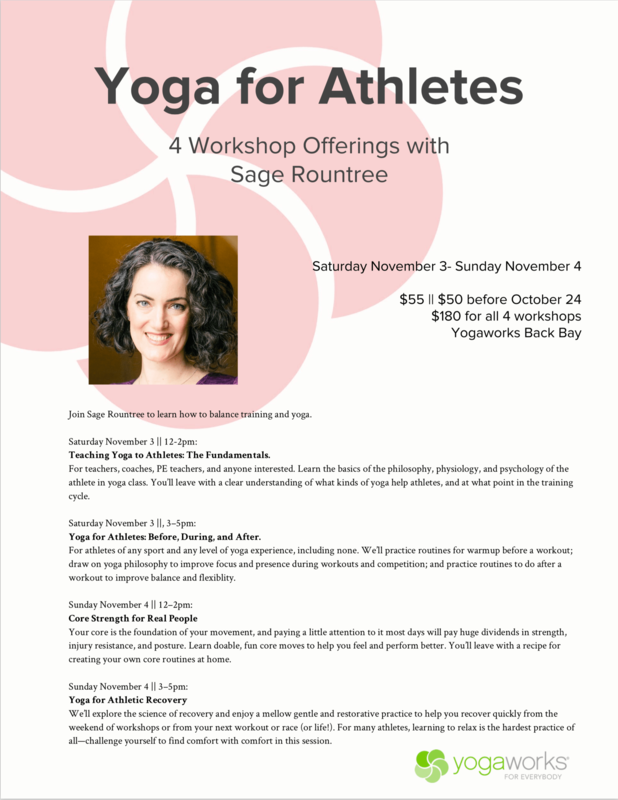 Teaching Yoga to Athletes: The Fundamentals, Saturday, November 3, noon–2:00 p.m.
Yoga for Athletes; Before, During, and After, Saturday, November 3, 3:00–5:00 p.m. Core Strength for Real People, Sunday, November 4, noon–2:00 p.m.
Yoga for Athletic Recovery, Sunday, November 4, 3:00–5:00 p.m. If you aren’t going to be in town, please do tell your friends who will. See you there!